There are a lot of products out there that claim to help you track how well you sleep at night, but not many of them can achieve that without actually causing some disruption to your sleep cycle. Wearable trackers can feel alien and clunky on your wrist, causing you to sleep just a little worse than you would if you weren’t wearing them. 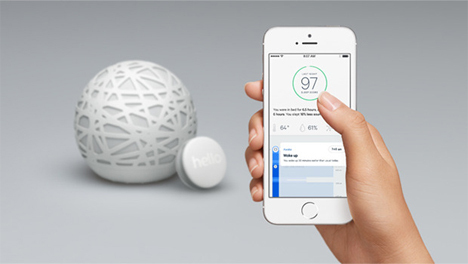 Sense from San Francisco-based company Hello is an entirely different type of sleep monitor. It’s designed to simply fade into the background of your life while monitoring all of the factors that go into you getting – or not getting – a good night’s sleep. 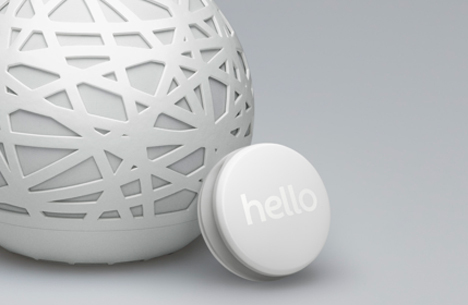 The Sense consists of two pieces: a small sensor-packed orb that sits bedside and a “sleep pill” sensor that clips onto your pillow. There is also, of course, an app that accompanies these physical sensors. 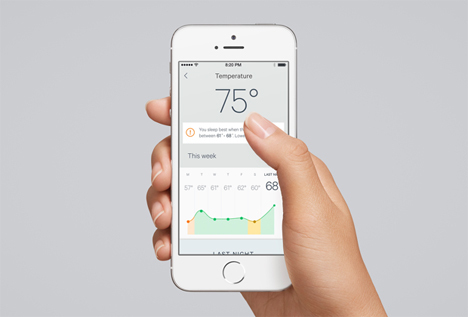 While you sleep, the sensors pick up on conditions in your bedroom like noise, temperature, movement, air particulates, and humidity. Both the Sense and the Sleep Pill are powered by a lithium battery and connect via Bluetooth Low Energy. Sense is also equipped with wifi. Every night, your environment and sleep quality add up to a unique Sleep Score. Different factors affect how each night’s sleep is scored. A neighbor’s barking dog can bring the score down by 10 points while the perfect temperature and complete darkness can boost the score by 20 or 30 points. The goal is to achieve a 100-point sleep: the perfect conditions, the optimal amount of rest, and a morning where you don’t feel groggy. Unlike the intrusive sleep monitors of which you are acutely aware at all times, Sense kind of fades into the background. The orb looks like a tiny sculpture, particularly when it softly glows from within. It can play soothing white noise to help you sleep better, and it also works as a smart alarm. The “smart” bit comes in when the Sleep Pill notices you are stirring, which is a sign you are ready to wake up. The system will wake you at an optimal time in your sleep cycle, even if it’s a few minutes before you’ve set your alarm to wake you, so that you aren’t awoken from a deep sleep feeling grouchy and tired. As the company points out, most of us think we’re getting better sleep than we actually are – yet we’re baffled as to why we feel run-down and groggy most days. Sense can help us pinpoint which factors need to change for us to get a better night’s sleep, whether that means eliminating noise or light sources or getting an air purifier for the bedroom. Wouldn’t the world be a happier place if everyone got the perfect night’s sleep? Sense completely destroyed its goal on Kickstarter almost as soon as it launched; if you get in before the campaign ends you can get a Sense and one Sleep Pill for $99 or a Sense and two Sleep Pills for $129.